Meetings and conferences are a regular feature for any business. Since the aim of business meetings and conferences is to get a group of people together to discuss and elaborate on specific topics, they are generally organised at special venues that have the necessary infrastructure. While day to day meetings can be held in one’s office, quarterly review meetings or special meetings aimed at imparting special skills or training to employees are generally held away from the office. 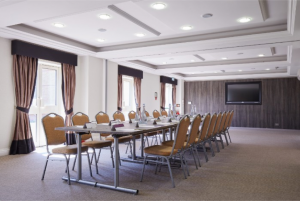 A great option for such office retreats is to choose meeting rooms in Milton Keynes, such as those offered by Mercure Milton Keynes Hotel, with just the right facilities and services to make your event a successful one. Milton Keynes has emerged as an attractive option for holding conferences and meetings, given its vast variety of hotels that are situated close to important areas, such as the train station, Bletchley Park, Milton Keynes Stadium and more. Why Choose Milton Keynes for Your Conference? Milton Keynes is new town near London, based on a grid network, with all its main roads running either horizontally or vertically across town. It is famous for its several public art works, including the Concrete Cows by Canadian artist Liz Leyh. Originally envisaged as a town to meet the housing shortage in London, Milton Keynes has emerged as a modern, efficient and pleasant place with hundreds of hotels offering world-class accommodation at affordable rates. These hotels not only offer comfortable accommodation, they also offer easy connectivity to the train station and airport, and the many attractions in the area, such as Silverstone, Woburn Safari Park, Milton Keynes Stadium, Central Shopping and more. Home to more than 22 million trees, two linear parks and 15 lakes to hold floodwater, the town offers an excellent ambience for meetings and conferences. Hotels near Bletchley Park and the train station are surrounded by grassy banks and beautiful, tall trees. The town is implementing special initiatives to protect the environment by promoting electric cars by offering a network of electric car charge points and running electric bus fleets. Several luxury hotels in Milton Keynes offer free parking & electric car charging points for the convenience of their guests. So, get ready to select your conference venue in the beautiful town of Milton Keynes.